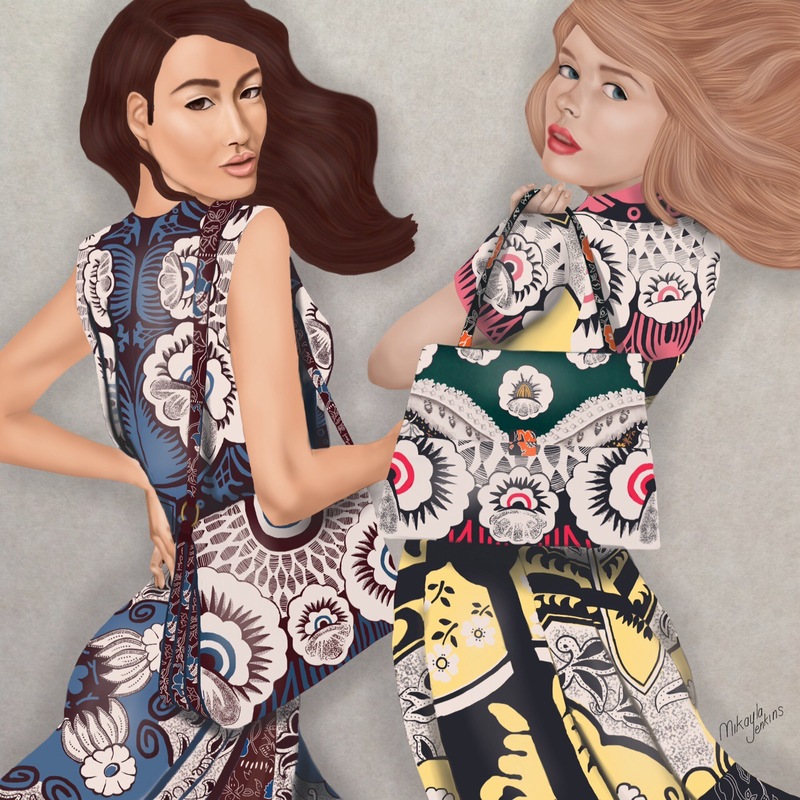 The gorgeous and whimsical patterns featured in Valentino’s Fall 2015 collection were my inspiration for this illustration. For this piece, I wanted to convey a sense of movement. Also, I wanted to feature a few of the Mime bags from the collection. My goal was to make viewers feel as if these ladies are going on an adventure. This is such a delightful illustration! I think you captured a sense of movement beautifully. Mikayla, you are on a level all to yourself! I’d be remiss this afternoon if I didn’t ask if you’ve ever created a BOOK COVER and if you have, what are your fees? I have not done a book cover before, but I live the idea of doing one. My fee would depend on the scope of the project. If you can give me a description of what you have in mind, I can give you a quote. You can email me at mikayla@sublimecravings.com if you like. I am so excited and have just recorded the details here in my working notebook. I’ve got to decide if I will lead with my second poetry book or one of my other book projects this year. Whatever I do, I want it in time to be submitted for a few contest award competitions! So please let me decide what I will work towards next and we will go from there. In the meanwhile, please take a peek at my other book covers on Amazon to see what I’ve had in the past! I am Claudia Moss of IF YOU LOVE ME, COME: a novel, SOFT TSUNAMI: a poetry collection, and THE WANDA B. WONDERS story collection. So sorry for not responding sooner. I’ve been pretty under the weather lately, but now I feel much better. I’ll be sure to check out your work on Amazon. So happy you are feeling much better!